A quick and easy meal to prepare when time is limited. 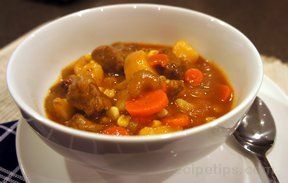 Select any brand of a thick steak, potato, and vegetable soup or stew. 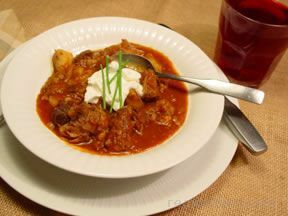 A soup with a thick sauce and stew-like ingredients will work the best. Empty contents of canned soup into a container for heating, either in the microwave or on the stovetop. Heat soup until ready to serve. Using a sharp knife, cut in a circular motion around the top of a large crusty bun, removing the top. Compress crumb down to form a bowl for the stew. 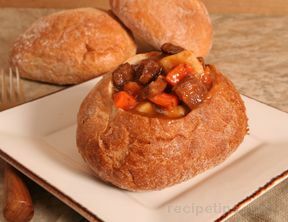 Spoon stew into bread bowls. Season with any spices or seasonings desired, such as herbs, salt, and pepper. And, if desired, add hot sauce to increase the spicy flavor. Note: If the sauce in the soup is too watery, it may require thickening, because a sauce that is too thin will moisten the bread excessively. 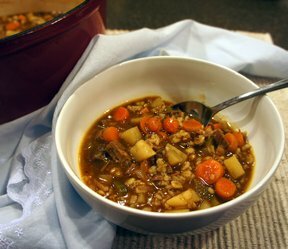 Most thick and hearty soups do not need to be thickened, but if necessary, place contents of can in a strainer with a bowl below. Drain the watery sauce away from soup, letting it drop into the bowl below the strainer. If desired, any amount of watery sauce can be thickened with 1 tablespoon cornstarch per can; then it can be added back into the soup or stew.